"The friends and family who care for someone with a rare disease really become experts and the ‘voice of care’," said Nicole Boice, Founder and CEO of Global Genes. Findings from a first-of-its-kind national snapshot of caregivers of individuals with a rare disease or condition paint a picture of friends and families facing emotional, financial, physical, and social strain with little support from outside resources. The National Alliance for Caregiving, in partnership with Global Genes, released findings of an online study by Greenwald & Associates, conducted in late 2017, of 1,406 unpaid caregivers ages 18 and over living in the United States who provide care to a child or adult with a rare disease or condition. It is estimated that at least 25 million Americans currently have a rare disease or condition; the National Institutes of Health estimates that there are approximately 7,000 rare diseases. In this study, over 400 unique rare diseases and conditions were captured, with the most commonly mentioned rare conditions as follows: Cystic Fibrosis (9%), Pulmonary arterial hypertension (4%), Atypical hemolytic uremic syndrome (2%), Ehlers-Donlos syndromes (2%), Fabry disease (2%), Congenital central hypoventilation syndrome (2%), and PANDAS (2%). The profile of a “rare caregiver” shows a strong family connection between caregiver and recipient: 62% are providing care to a child under the age of 18 with the average age being 20.9 years old; 89% live in the same household as their care recipient; and, 70% of the care recipients’ condition or disease is genetic. Rare caregivers say more time is spent on managing symptoms than the actual disease: 82% report that treatments or therapies are used for symptom management. Getting access to treatments can be a challenge: 34% report difficulty in accessing treatments for symptom management, and 31% report difficulty in accessing treatment for the underlying disease. One in four reports their care recipient has participated in a clinical trial. On average, rare caregivers of adults spend about 37 hours a week providing care (12 more hours a week than general caregivers). Even more time is spent in caring for a child: 53 hours a week on average, compared to 30 hours for general child caregivers. Nearly all reported taking on activities related to care communication and advocacy (94%). Other “voice of care” roles include: educating healthcare professionals about their care recipient’s condition (89%) or helping with medical/nursing tasks (84%) -- a defining feature of rare caregiving, as these tasks remain for the duration of their role. Rare caregivers also become researchers by finding, accessing and managing aspects of participation in clinical trials, including tasks such as paperwork (77%), transportation (65%), trial response documentation (62%), and care coordination (59%). Rare caregivers report a range of stresses and strains: 74% struggle with a sense of loss for what their care recipient’s life could have been; 67% say providing care to their recipient is emotionally stressful (twice as high as that for general caregivers); 59% exhausted personal savings; 9% have filed for bankruptcy; 53% report feeling alone; 51% report they have difficulty maintaining friendships; and, 37% report high physical strain. “Despite the impact of caregiving, we see that rare caregivers are not reaching out for support services,” said Boice. Only 33% report use of paid help or aides, 22% have used respite, and 14% rely on an outside transportation service. “The study uncovers a missed opportunity in the communication the rare caregiver has with healthcare practitioners,” said Whiting. Although 48% have had a doctor, nurse, or social worker ask what was needed to provide care to the recipient, just one in four have had these discussions about their own care needs. “We need to create a dialogue that includes the needs of the rare caregiver,” she added. The study revealed a ripple effect on rare caregiving families: 24% say at least one youth under age 18 helps; 1 in 10 rare caregivers are students who often struggle to fulfill their school responsibilities; 59% report receiving help from at least one other unpaid caregiver; and, only 35% have a contingency plan in place in case they are unable to provide care. Enhance the health of family caregivers through access to respite and counseling. Achieve financial security and workplace protections for family caregivers. Ensure that family caregivers receive comprehensive training and information. Improve care coordination between skilled home health providers, direct care workers, and family caregivers. Expand services and supports available to family caregivers on the community level. Include the family caregiver as a vital member of the team in healthcare settings. Recognize the family caregiver's role in clinical trial research and innovation. 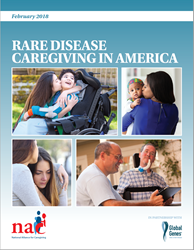 The report and related materials are available at http://www.caregiving.org/rare. Established in 1996, the National Alliance for Caregiving is a non-profit coalition of national organizations focusing on advancing family caregiving through research, innovation, and advocacy. The Alliance conducts research, does policy analysis, develops national best-practice programs, and works to increase public awareness of family caregiving issues. Recognizing that family caregivers provide important societal and financial contributions toward maintaining the well-being of those they care for, the Alliance supports a network of more than 80 state and local caregiving coalitions and serves as Secretariat for the International Alliance of Carer Organizations (IACO). Learn more at http://www.caregiving.org. Global Genes is a leading rare disease patient advocacy organization whose mission is to connect, empower, and inspire the rare disease community. With international scope, Global Genes develops educational resources, programs, and events that unite patients, advocates, and industry experts. Committed to fostering these meaningful connections, Global Genes is driven to catalyze therapeutics and cures for the estimated 7,000 rare diseases that impact approximately 1 in 10 Americans, and 350 million people worldwide. For more information, please visit Global Genes and follow @GlobalGenes on social media to join the RARE conversation! Greenwald & Associates is a full-service custom research firm, specializing in the areas of healthcare, financial services, and employee benefits. Learn more at http://greenwaldresearch.com/.